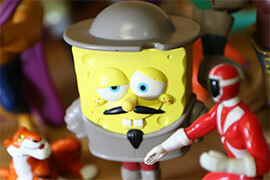 SpongeBob SquarePants and friends are helpful teachers in the classroom of play therapy. Bart Simpson, Scooby-Doo, the Powerpuff Girls, SpongeBob SquarePants, Bugs Bunny and other cartoon characters are teaching Stetson graduate students the power of play. That’s where those cartoon characters — or, rather, miniature plastic figures of them and many others — come into play. Venture into the Department of Counselor Education’s play-therapy room at Flagler Hall and you step into a child’s paradise stuffed with Buzz Lightyear, Clifford the Big Red Dog, My Little Pony, Mr. Potato Head and Hot Wheels, along with teddy bears, a sand tray (tabletop sandbox), plastic toy people, soldiers, dogs, horses, dinosaurs and more. Some spooky stuff lurks in the play-therapy room, too: plastic skulls, skeletons, snakes, a creepy witch and even a miniature black casket with the white block letters RIP. Lopez and the 11 other students in the play-therapy program are getting real-world, hands-on experience bringing characters to life for children in need through service learning. Meanwhile, the Counselor Education graduate program is very real — with the blessing of the Council for Accreditation of Counseling and Related Educational Programs, which accredits master’s and doctoral degree programs in counseling and its specialties offered by colleges and universities in the United States and throughout the world. Stetson’s Counselor Education graduate students can specialize in either Clinical Mental Health Counseling or Marriage, Couple and Family Counseling. Regardless of program choice, students are guaranteed a highly experiential-learning environment. 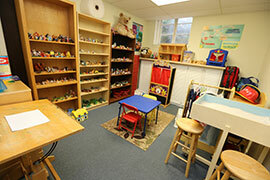 The Play Therapy Certificate Program service learning lab is a prime example. Under faculty supervision, the Stetson play-therapy students work at various locations of Head Start in Volusia County. A program of the U.S. Department of Health and Human Services, Head Start provides early-childhood education, health, nutrition and parent involvement services to low-income children and their families. Graduate student Gloria Lopez ’19 and 11 other students receive real-world experience bringing characters to life for children in need. The goal of the students’ work, simply, is to create positive mental, social and/or behavioral change. And, yes, the strategies work. 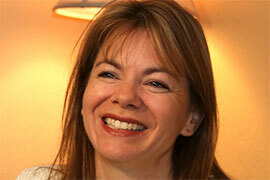 Page Thanasiu, Ph.D., is an assistant professor of counselor education and a Registered Play Therapist-Supervisor. Students in the program learn “that there are numerous ways we communicate that aren’t verbal,” added Thanasiu, noting that the program also teaches another nonverbal method known as expressive arts interventions. Thanasiu taught and supervised the hands-on lab at Head Start for the first two years after founding the play therapy program at Stetson in 2014. 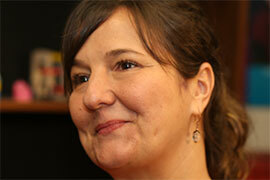 Soni McCarty, a Longwood-based licensed clinician, currently heads the lab. McCarty meets with two Head Start behavioral specialists to identify children in need and the severity of the need. Stetson students are introduced into the process incrementally. Students work with children who may be facing “a lack of structure at home or a variety of adverse experiences that have left them struggling with some very intense emotions,” Thanasiu said. Essentially, for the graduate students it’s all about learning by doing. “We’ll cover the theoretical aspect in class, and students have textbook reading to complete. I show videos of myself working with children to demonstrate what the process looks like,” Thanasiu said. Students’ sessions with the Head Start children are videoed for later study, with McCarty watching from a separate room along with the other students.